Is every electric toothbrush out there good for sensitive teeth and receding gums? The answer to that is, no. Every toothbrush maker claims their toothbrush is good. But is it good for you? That’s the question you should ask before you buy. If you have sensitive teeth and maybe receding gums, fortunately, this comprehensive review is the solution you need. I took my time to research the best electric toothbrush for sensitive teeth. The goal of my research was to find the best toothbrush for you. After testing lots of toothbrushes and reaching out to consumers, I found five best toothbrushes for sensitive teeth. Or, let me rephrase the question: how do sensitive teeth feel like? If you avoid hot or cold drinks because they’ll make your teeth hurt, it’s a sign that you have sensitive teeth. If you breathe in cold air, and somehow, your teeth react to that. Or, if some foods make your teeth uncomfortable, it may be a sign of teeth sensitivity. You shouldn’t feel any discomfort in your teeth after eating or drinking. After realizing you have sensitive teeth, you need an electric toothbrush that will take it easy on your teeth and help you recover. Many people find it difficult to find the right toothbrush that’s perfect for sensitive teeth. In the process of using any toothbrush, some people cause more damage to their already sensitive teeth. The good news is you don’t have to worry about that. You won’t cause any further damage to your teeth after reading this review. You’ll discover the five best electric toothbrushes for sensitive teeth. DiamondClean Smart Electric Toothbrush is one of the best Philips Sonicare’s toothbrushes that give the most exceptional clean and complete care. According to an internal study by the Philips Sonicare brand itself, the brush removes 10x more plaque and improves gum health 7x more in just 2 weeks when compared to manual toothbrushes. After checking many toothbrushes, I rate DiamondClean very highly. It’s perfect for anyone with sensitive teeth. The toothbrush removes 100% more stains in 3 days than manual toothbrushes. 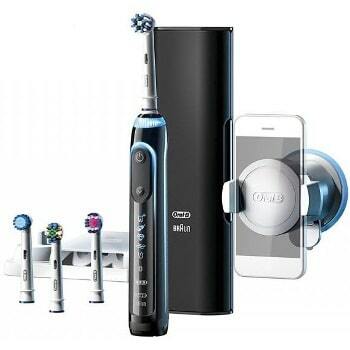 Diamond Clean Smart Electric Toothbrush has three different smart brush head to choose from. These smart heads will give you some brushing feedback on your Android smartphone or iOS device. You need this feedback if you have sensitive teeth. It allows you to track how your teeth and gums are improving. There are four modes to choose from: Clean, White+, Deep Clean+, and Gum health. There are three intensity levels you can select when brushing. The toothbrush is rechargeable. This electric toothbrush uses a unique sonic technology to clean teeth with up to 31,000 brush strokes per minute. Diamond Clean Smart Electric Toothbrush can sweep into the deep tight places between your teeth and along your gum line. As a result of that, you have healthier and cleaner teeth that get less sensitive as you use the toothbrush. You’ll get three amazing brush heads when you buy this toothbrush. All you have to do when you want to use the toothbrush is press the power button, and it’ll start working immediately. The smart sensors that are embedded in this toothbrush help you take the guesswork out of brushing. The sensors show you where you’ve brushed. And more importantly, they also tell you where you missed. While the toothbrush itself is overwhelmingly great, the same can’t be said of the travel case that comes with it. Of course, you should care less about the case. But for travelers like me, I feel a better case for my toothbrush will be cool. I’ll love to see the Philips Sonicare brand make a better case for this amazing electric toothbrush. I’m a big fan of the Oral-B brand because they make the best oral care products. Oral-B 7000 Electric Toothbrush is excellent for people with sensitive teeth. This toothbrush also gives you real-time feedback on your brushing performance. You can use it to track your brushing habits. It shows you the missed areas. It tells you when you’re brushing too hard, which isn’t good for your sensitive teeth. You’ll also get useful brushing tips to help you clean your teeth better. Oral-B 7000 Electric Toothbrush is made of silicone. Silicone is the ideal material used for making toothbrushes. It’s been clinically proven that this toothbrush removes 100% more plaque than manual toothbrushes. Oral-B 7000 Electric Toothbrush has six cleaning modes namely: Daily Clean, Gum Care, Sensitive, Whitening, Deep Clean, and Tongue Cleaner. This is one of my favorite toothbrushes for sensitive teeth. You won’t be disappointed buying it. It works incredibly well and gets the job done with ease. The toothbrush has Bluetooth communication. It means you can connect it with most smartphones and receive feedback on how well you’re brushing your teeth. You need a smart toothbrush like this if you want to ensure that you give your teeth the best cleaning it needs to eradicate sensitivity. It has a pressure light to tell when you’re over-brushing your teeth. Over-brushing is bad for sensitive teeth. It only makes the teeth more sensitive. 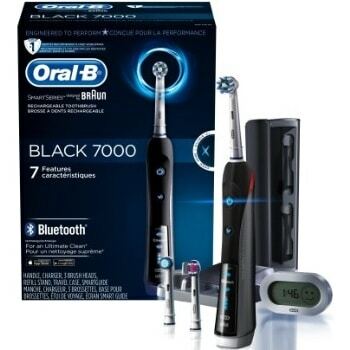 With a smart toothbrush like Oral-B 7000, you can be sure that you won’t be causing any further damage to your teeth. The Oral-B brand is the most recommended by dentists around the world. That’s because they’ve satisfied customers for many years. Oral-B 7000 ensures that your teeth are fresher and healthier. The toothbrush takes care of your teeth well. It does that more than you’ll ever get from any manual or regular toothbrush. I highly recommend Oral-B 7000 because it’s been tested and proven to be the best toothbrush for sensitive teeth. The major downside to this electric toothbrush is that its battery doesn’t really last that long enough compared to other electric toothbrushes. The amazing technology that’s built in the toothbrush consumes power. Be prepared to charge every 2-3 days with Oral-B 7000 Electric Toothbrush. 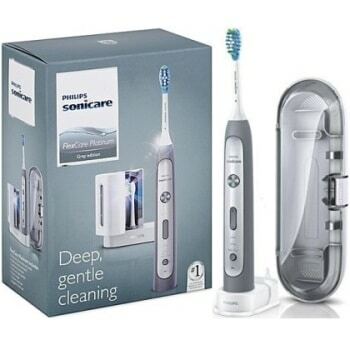 Flexcare Platinum is another high-quality electric toothbrush from Philips Sonicare. Flexcare Platinum removes 10x more plaque than a manual toothbrush, and it’s great for people with sensitive teeth. Even with sensitive teeth, this toothbrush gives you a deep clean you’ll never get from a manual toothbrush. The toothbrush has nine customizable brushing experiences with three intensity settings to adapt to your brushing needs. Flexcare Platinum has an intuitive pressure sensor that tracks how hard you’re brushing your teeth. The brush head of this electric toothbrush is made with an advanced technology you won’t get in other toothbrushes. The Sonic Technology used is patented and it works effectively well for anyone with sensitive teeth. I should tell you that very few if any brands can beat the high-quality toothbrushes from Philips Sonicare. This toothbrush automatically alerts you when you’re brushing too hard. If you charge Flexcare Platinum electric toothbrush for 24 hours, you’ll be able to use the toothbrush for 3 weeks. Yes, it’ll last you if you brush 2 minutes and twice daily for a full 3 weeks. It has a great battery that can serve you for a very long time. Your gums will surely thank you if you buy Flexcare Platinum electric toothbrush. It ensures that your gum lines are cleaned each time you brush your teeth. Because Flexcare Platinum electric toothbrush can last 3 weeks after 24 hours full battery charge, it’s my favorite toothbrush for traveling. So, if you travel a lot and you’re battling with sensitive teeth, this is the toothbrush for you. It ensures that your sensitive teeth are well-taken care of in your journey. I should emphasize that to really enjoy this toothbrush, you should make sure it’s fully charged before you leave home. That means you’ll never worry about charging for most of the duration of your journey. It’s also for people who don’t travel much too. It gets the job done. It cleanses your sensitive teeth well and helps you reduce the sensitiveness in there. This toothbrush removes stains from your teeth with ease whether you’re battling with sensitiveness or not. It gives you the best clean you need to eradicate sensitivity in your teeth. This toothbrush has the word “platinum” in it for a reason. Perhaps, because it does a great job. But I consider Philips Sonicare Flexcare Platinum Electric Toothbrush as one of the most expensive toothbrushes available today. Philips Sonicare may argue that it’s an excellent toothbrush, but it’ll be nice if they can reduce the price of the toothbrush a bit. 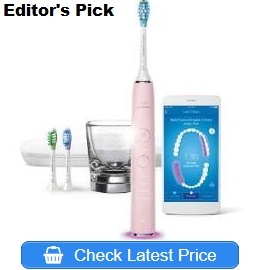 If the price isn’t a problem for you and you want a premium electric toothbrush for your sensitive teeth, then this is the perfect toothbrush for you. This is an upgrade on the Oral-B 7000 Electric Toothbrush. Oral-B Genius Pro 8000 Electric Toothbrush is a premium toothbrush that’s made for anyone with sensitive teeth. No matter the level of the sensitiveness, this is a toothbrush you can rely upon to give you the best deep clean that will improve your oral health. 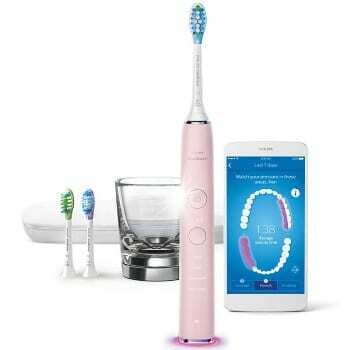 You can pair the toothbrush with your smartphone to use its Personal Detection feature which uses facial recognition to tell you where you’ve brushed on your teeth. It has a SmartRing feature that provides you with real-time visual coaching on the brushing time. This feature helps you brush your teeth as dentists recommend. As you would expect from a premium toothbrush like this, it has a pressure sensor to slow the brushing speed automatically. That prevents over-brushing. 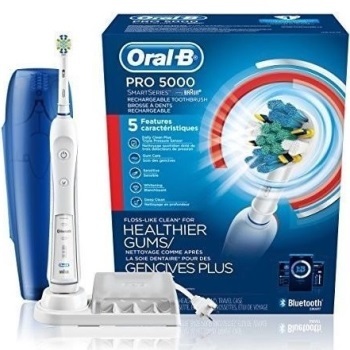 Oral-B Genius Pro 8000 Electric Toothbrush has six brushing modes, namely: Daily Clean, Gum Care, Sensitive, Whitening, Tongue Cleaning and Pro-Clean Mode. You can choose any mode based on your needs. The toothbrush also comes with a smart travel case. You can put it in this case when you’re traveling. The toothbrush has a built-in 2-minute timer. Two minutes is the recommended duration for brushing. Oral-B Genius Pro 8000 Electric Toothbrush gives you a superior clean you’ll never get from a manual toothbrush. The Bluetooth technology that connects to your phone lets you see your brushing performance. You’ll be able to see where you’ve brushed and where you haven’t. The toothbrush helps you brush your teeth well. A full charge of this toothbrush can last you up to 12 days. If in any case you aren’t happy with Genius Pro 8000 Electric Toothbrush, you’re free to return the product and ask for a refund within 60 days of purchase. I’m super confident that you’ll be satisfied with the results from the toothbrush. After using this toothbrush, I feel impressed. The whitening results are also amazing. Many people with sensitive teeth also reported positive views about the toothbrush. This toothbrush has so many features that often leave new users confused. When you check the instructions that come with the toothbrush, very few paragraphs were written about each feature. A new beginner will be so confused they won’t know where to start from. I often use the simple features. I’m okay with one or two features. Sometimes, I do visit the product page online to read more about other features that might interest me. I’ll like Oral-B to write a little bit more about each feature in the instruction that comes with the package. Note that there’s nothing wrong with the toothbrush. It works fine. You may be surprised that this is another toothbrush from Oral-B. Oral-B makes the best toothbrushes in the world. The brand has been around since 1950, so you can understand why. People trust Oral-B because it makes some of the world’s best oral hygiene products. Oral-B Pro 5000 Electric Toothbrush is cheaper than both the 7000 and 8000 series, and it’s great for sensitive teeth too. In fact, most people buy Oral-B Pro 5000 Electric Toothbrush more than the rest because it’s affordable than those two. The toothbrush uses Bluetooth communication to provide you with real-time brushing feedback. It also has the pressure sensor technology to alert you when you’re brushing too hard with the toothbrush. Oral-B Pro 5000 Electric Toothbrush comes with five brushing modes. They are Daily Clean, Gum Care, Sensitive, Whitening, and Deep Clean. You won’t be disappointed by the experience you’ll get from these modes. The toothbrush removes more plaque than any manual or regular toothbrush. If you’re looking for the best toothbrush for sensitive teeth, I’m 99.9% certain that you’ll like Oral-B Pro 5000 Electric Toothbrush. The toothbrush will leave your teeth whiter and your gums healthier. With time, you’ll start to feel less sensitivity in your teeth. Most dentists recommend the Oral-B Pro 5000 Electric Toothbrush because it’s affordable and it gets the job done with ease. If you don’t really care about much features and just want something that cleans your sensitive teeth and receding gums, then don’t hesitate to choose this electric toothbrush. After buying this toothbrush, you’ll immediately recognize the clear difference between manual brushing and an electric toothbrush. Most people new to Philips Sonicare toothbrushes often buy this version first before considering upgrading to any of the above electric toothbrushes. There are also some people who’ve been using the 5000 version for years and are happy with the deep clean it gives them. It’ll be up to you to decide if you’ll like to upgrade in the future or not. The toothbrush also has a 2-minute timer that allows you to brush every part of your teeth within the dentists recommended time. There’s absolutely nothing wrong with starting with Oral-B 5000 Electric Toothbrush. I consider the best electric toothbrush for sensitive teeth. The battery is a major issue with this toothbrush. It takes 24 hours to charge fully and only lasts for a week. That means you have to charge the battery every week. Despite that, I believe the Oral-B 5000 Electric Toothbrush is just the best option available today. You can’t compare the results to that of manual brushing. Teeth sensitivity is a common problem that affects many people worldwide. 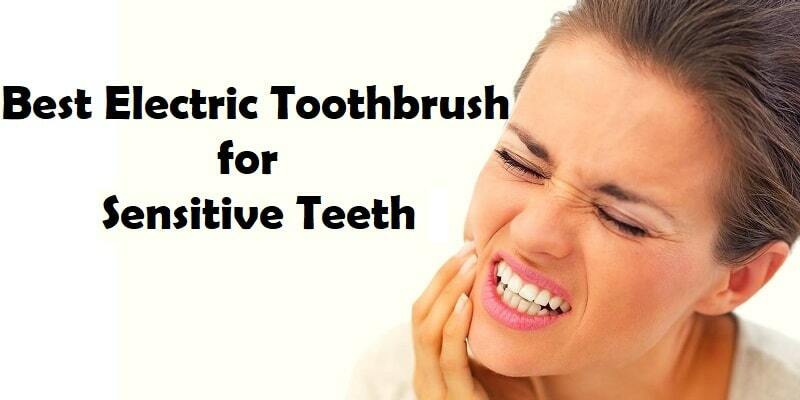 Using an electric toothbrush will help you get rid of sensitivity in your teeth. But, you should also know the top causes of teeth sensitivity to help you get rid of it faster. Brushing too hard is bad for your teeth. Some people brush too hard because they are so determined to get out bacteria and make their teeth whiter. But it doesn’t work that way. It takes some time to get your teeth well cleaned. Healthier teeth are the result of daily brushing – morning and night. It doesn’t take one instant brush to make the plaque that’s been building up for days, weeks, months or even years go away. Making use of toothbrushes with hard bristles is another top reason for sensitive teeth. I’ll say it’s almost the same thing as brushing too hard. Teeth-whitening toothpaste contains harsh chemicals that are bad for your teeth. Chemical ingredients such as Triclosan, Fluoride, Diethanolamine and Sodium Lauryl Sulfate harm your oral health. Those teeth-whitening chemicals continue to lurk in your mouth and teeth long after you’d brushed. They are still there and dangerous. If your toothpaste contains whitening agents, it’s time you stop using it. Even an electric toothbrush won’t do much help in making the sensitivity disappear if you continue to use those kinds of toothpaste. Alcohol is a common ingredient in most over-the-counter mouthwashes. Alcohol is bad for the teeth. Too much of alcohol from your mouthwash will only increase sensitivity in your teeth. Try mouthwashes that are made with more natural ingredients. They tend to be better than mouthwashes made with alcohol. Flossing and brushing help you remove plaque from your teeth. You should know that some foods will stick in between your teeth. If the food stays there for a long time, it turns into plaque. Over time, if you don’t brush twice daily and floss regularly, the plaque under your teeth will start to build up. Plaque buildup is a serious dental issue. It means bacteria are under your teeth and your teeth may start to feel some sensitivity. If you don’t brush regularly as you should, part of your teeth will start to lose firmness. The tooth may slowly weaken. You’ll start to feel some discomfort in there. It’s difficult to heal a tooth that’s decaying. Most times, the teeth have to be removed and may be replaced if you still want something there. Decaying teeth is common among old people who have a history of not brushing twice daily. The presence of gum recession is a clear sign that you’re suffering from periodontal disease. Most diseases arise as a result of bacterial overgrowth in the teeth. Bacteria overgrowth occurs when you don’t brush your teeth regularly, or you rarely brush it at all. It’ll be hard for an electric toothbrush to help you heal gum recession. However, getting the right electric toothbrush will be a lot more helpful to your healing process than a manual toothbrush. Some foods are not just good for the teeth. Eating them may be healthy, but overconsumption may lead to sensitive teeth. Acidic foods are bad for the teeth. Common acidic foods are tomato sauce, lemon, grapefruit, kiwi, and pickles. All these acidic foods can cause discomfort to your teeth. Avoid eating them. Also, you shouldn’t eat them alone when you do. I’ll advise you eat them with other foods. Most new electric toothbrushes offer lots of amazing features. However, too many features can be problematic. It could make the toothbrush even more difficult to use. You only need some basic features. These features are the ones you really need to reduce and eventually eradicate sensitivity in your teeth. A great electric toothbrush should have a pressure sensor in it that tells you when you’re over-brushing. Pressure sensor warns you immediately you start applying too much pressure on your teeth. This is something you’ll never get from a manual toothbrush. The pressure sensor is a key feature you should always look for in an electric toothbrush. All the toothbrushes I reviewed above have pressure sensors in them. As you may know, there are different types of brushing styles. Some styles are great for sensitive teeth. Some are good for deep cleaning. Some are great for teeth whitening. Well, in electric toothbrushes, we call them brushing modes. You choose the brushing mode your mouth and teeth are more comfortable with. If you have sensitive teeth, most electric toothbrushes offer the sensitive mode. Make sure the sensitive mode is available before you buy the toothbrush. Great electric toothbrushes can make up to 31,000 strokes per minute. For some, it’s around 20,000 strokes per minute. The higher the intensity level you choose, the more the strokes. Just like brushing modes, there should be an option to choose your preferred intensity level. There are three types of brush heads: soft, medium and hard. I’ll advise you to stay away from hard brush heads. Buying a hard brush head will lead to over-brushing, which won’t be helping your sensitive teeth. I’m a big fan of soft brush heads. You rarely over-brush with it, and it’s easy for your mouth to adjust to it. If you consider soft to be too much soft for you, you should buy medium brush heads. There are also cool too – just a little firmer. Dentists generally recommend brushing your teeth for 2 minutes and doing that twice daily. The timer is very important when you want to make twice-daily brushing a habit. Check the package to find if the two-minute timer option is available. If it isn’t, then there’s no point in buying the electric toothbrush. All the best toothbrushes listed above have two-minute timers in them. The five amazing toothbrushes I took my time to research and write here are the best electric toothbrushes for sensitive teeth. Keep in mind that there are lots of toothbrushes available on the market, but many of them aren’t good for you. Now you know the toothbrushes you should use for your sensitive teeth. Toothpastes For Sensitive Teeth – Which is Best?